Have you noticed how quickly technology changes?! There is no end in sight to the improvements and impact on our lives. That’s good news for the advancement of modern civilization in many regards, BUT, when it comes to childbirth, technology can be excessive, intrusive and harmful. Yes, harmful! Never mind the risks of pitocin, epidurals and C-sections. There are many technologies used in childbirth that do not improve the outcome. In fact, if you do your research, you may discover that you need to exert caution if you agree to medical assistance that is not necessary. Think about what is truly “necessary” for the health and well being of you and your baby. I’d like to mention ultrasound / sonogram. Many women do not know the potential dangers of routine ultrasound. Some studies are conclusive and others are persuasive. Thousands of women show up weekly for their routine ultrasounds – baby’s first picture. Others consent to an ultrasound, “just in case” something is wrong or imperfect. And what do you say to members of the pro-life community who use ultrasound on women in crisis pregnancies? They claim ultrasound is saving babies. Do the ends justify the means? Is there another way to persuade women of the precious life growing within them without using something that startles (and has the potential to adversely affect) their unborn baby? As technology improves, many people have less patience or interest in natural processes. Women are not as confident in their bodies to give birth; they often do not choose to trust nature, God, themselves or their partners. Why should they when they have technology to guide, direct, relieve and save them from pain and imperfection? Expectant mothers should be wary of having technology replacing the natural process. I remember during the birth of my first child in 1988 – the television set was on and during labor, my husband and the doctor’s attention was drawn to a skit on a late night television show. I don’t think I had an electronic fetal monitor, but I do recall an IV during that birth. I know it progressed rapidly, but I did not feel I had the attention I wanted or needed at the time. When we become reliant on the fancy, convenient technology, it is possible that we will not prefer the natural process. We risk not focusing on the person giving birth if we are concerned with the measurements and science of birth. Eventually, the natural has to be learned since it is not remembered. We are not in touch with our instincts and the natural is seen as inferior. 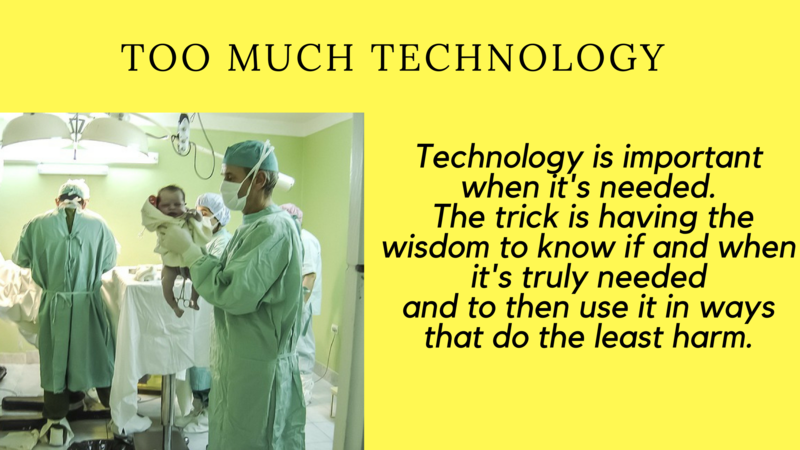 Technology is important when it is needed. The trick is having the wisdom to know if and when it is truly needed and to then use it in ways that do the least harm.